Home Real Estate What can migration patterns tell us about the housing market? When measuring the health of a metro’s housing market, analysts most often examine home price appreciation, available inventory and days on market. 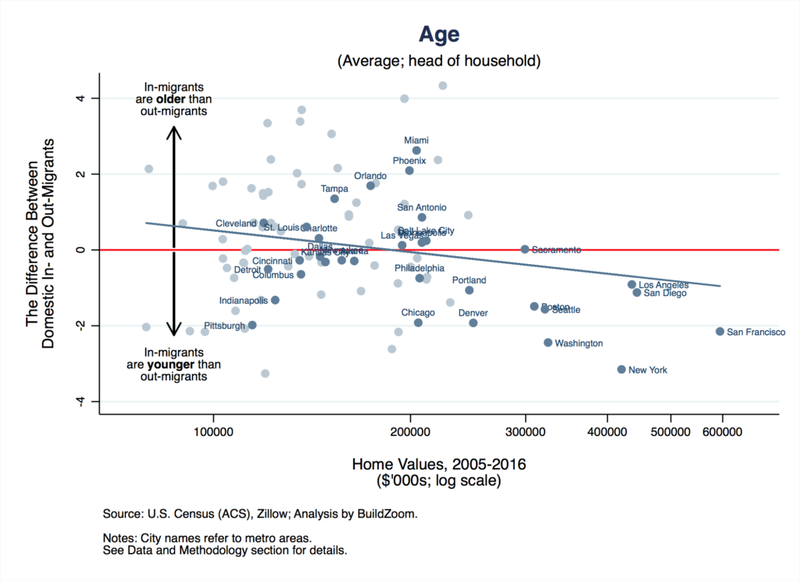 But further insights can be gathered about the future of the nation’s largest markets by tracking inbound and outbound migration trends across demographics, such as age, education and income level, according to a post by BuildZoom Chief Economist Dr. Issi Romem. When it comes to income level, Romem discovered the most expensive coastal metros exhibited positive income sorting, meaning that the incomes of in-migrants are more than the incomes of out-migrants. Over the course of 11 years, San Francisco in-migrants, on average, earned $12,640 more a year per household than people leaving the city. Although San Francisco is an extreme example of positive income sorting, Romem says, the trend holds true across other coastal markets, such as New York, Los Angeles, San Diego, Washington and Seattle. In each of these metros, the difference between in- and out-migrants’ incomes is more positive in cities with higher housing prices. 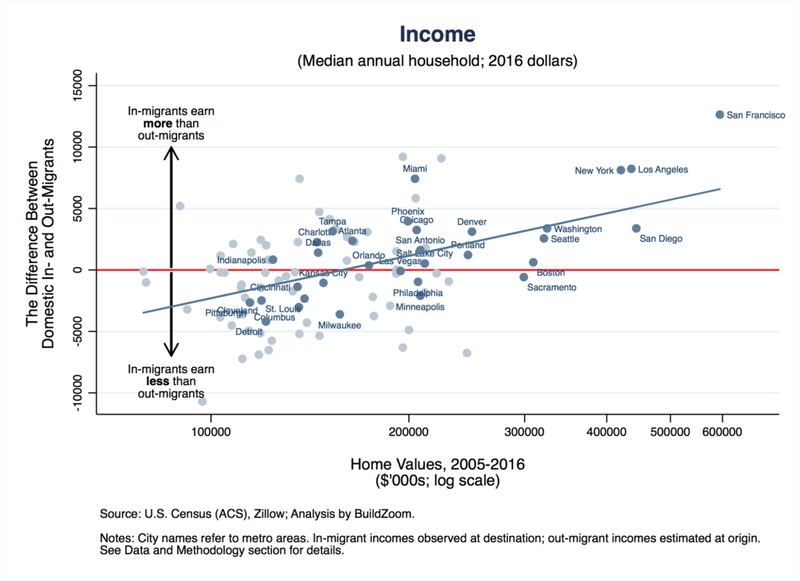 Meanwhile, in affordable metros like Atlanta and Dallas, inbound and outbound migrants’ incomes are equal, and in Rust Belt metros like Cleveland and Detroit, in-migrant incomes are less than people leaving the city. Previous articleBuying Investment Property: Learn EXACTLY How It’s Done With This In-Depth Case Study! Your debt-to-income ratio, or DTI, is the percentage of monthly income you pay toward your monthly debts, including a new mortgage payment. Fannie Mae increased its maximum DTI ratio to 50 percent, up from 45 percent, in July 2017. However, you’ll pay private mortgage insurance when you put less than 20 percent down — and you might not be able to borrow as much as you need to buy a home. “We’re still about one-quarter of where we were compared to the pre-housing boom,” says Kan of mortgage credit accessibility. “Standards are looser now than they were from 2010 to 2012 when credit access was the tightest, but it’s not subprime.” The share of new, conventional conforming home-loans with a DTI ratio above 45 percent spiked after Fannie Mae raised its DTI limit, according to research from CoreLogic. Even as high DTI loans gain popularity, lenders haven’t budged on credit score standards. Borrowers’ average credit score for conventional, conforming purchase loans remained unchanged at 755 in the first quarter of 2018 compared to the same period a year ago, CoreLogic found. That’s significantly higher than homebuyers’ average credit score of 705 in 2001 — before the downturn. A high LTV ratio increases borrowing costs, and you’ll likely have to pay mortgage insurance to offset the lender’s risk. “Today, people have significantly less savings in reserve.